At Revere Control Systems, we engineer controls for an incredible range of applications. From specialized services for clients in a variety of municipal and industrial applications to control systems for original equipment manufacturers, we excel in full-service systems integration. But that’s a promise you’ve heard before. Revere stands out for two distinct reasons. We are independent, meaning we are responsible only to the best solution for you and your business. We also have a depth of talent and experience unmatched in our industry. We design and deliver every job to the highest standards, and we stand behind those solutions to ensure they work precisely as you need. We talk about the solutions we can deliver to you below, but more importantly, we want to talk to you about your unique needs and how we can engineer a solution to help you reach your business goals. Controls that give you control. We have a lot of capabilities, but our first love has always been control systems. We’ve been designing world-class control systems since we opened in 1980, and our expertise in the field runs deep. We’re an independent integrator, but we’re not agnostic. We use our depth of experience with to help you choose the best automation solution. Our first job is to listen to your vision. Only when we understand your processes, your equipment, and your goals do we add our innovative ideas and best technologies to improve your profits through well-designed standard and custom machine controls. We add value by providing accurate work, responsive service, and a consistent focus to improve your experience from proposal development through system acceptance. Industry estimates place nearly $22 billion of control system platforms in North America at or near the end of their useful lives. In most cases, these systems are more than 20 years old, yet they are at the heart of much of the nation’s production and water/wastewater facilities. Despite the significant security and financial risks this obsolescence poses, many struggle to plan for or justify the hassle of modernization projects. Revere has decades of experience creating custom modernization programs that are optimized to deliver maximum value, mitigate risk to the production schedule, and prevent budget overruns. Let us help guide your facility into the new age of automation. Got a larger automation project? We have dedicated Project Managers equipped to tackle your job. Revere has in-house PMI-certified Project Management Professionals with experience in a variety of fields, so regardless of the complexity of your job, we’re ready to manage it from design to startup. Let us help you automate your success. Whether your project is standalone automation or a subset of a much larger plant project, our construction design/build services are ready to make your job a success. 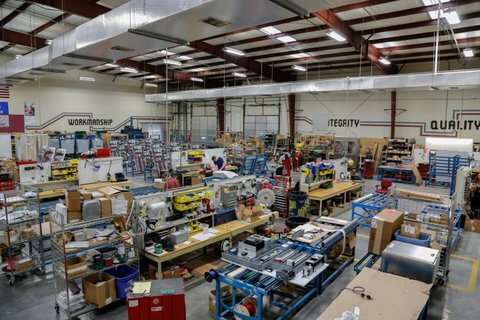 Design-Build for automation involves engineering, procurement, and the electrical construction needed to support the automation and controls elements, all without the red tape and liability gaps of the traditional design-bid-build process. With a single Design-Build entity, the roles of designer and constructor are integrated, producing a unified flow of work from initial concept through startup and commissioning. This streamlining through a single contract creates a collaborative relationship between designer and builder that can focus on optimizing project schedules, costs, and quality. Our wealth of knowledge and ability, borne from decades of experience, uniquely position us to deliver world-class design-build automation solutions. As a member of the Design-Build Institute of America, Revere works on the cutting edge of project design and management, bringing maximum value to you. Design-Build project delivery harkens back to the concept of a master builder. The master builder embodied all three disciplines of architecture, engineering, and construction in a single entity, and it was under this concept that most of the wonders of the world were built. We want to produce automation wonders in your plant using this same approach. Let us be the master builder on your next control system project. We understand the impact quality on your project. Any production flaws typically show up during installation and startup, when it’s most expensive and time-consuming to fix. That’s why we take no shortcuts in producing the panels for our systems. Many small and low-cost panel shops simply can’t provide the extra attention to quality that we do. We build panels to meet UL 508A and 698A standards, as well as CSA. 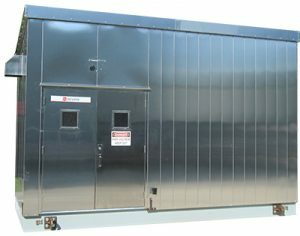 This allows us to provide explosion-proof, purged/pressurized, and nonincendive control panels for a variety of hazardous locations. We’re also experts at designing, outfitting, and commissioning E-Houses. From mining in Kazakhstan to textiles in South Carolina, utility management in New York City to tunnel boring in Miami, our e-house designs fit a wide range of projects in many industries. E-house demand is growing. If you’ve got a problem that an e-house might solve, Revere is ready to make it happen. Let us put our design and fabrication experts to work for you. In our decades of control system integration, we’ve gathered industry-leading expertise on everything it takes to make your facility run efficiently, effectively, and within regulations. Our engineering experts are available to discuss and develop a comprehensive range of project guidelines in the process automation field. Clients can deploy our team to develop new plans based on submitted specifications, or rely on experience-driven guidance to amend and improve existing proposals. Any time that your employees or contract personnel are working on or near live circuits, you are responsible for providing safe working conditions. As well as individual services, we offer a comprehensive, five-year Arc Flash Compliance program that ensures your company’s compliance. From Arc Flash Studies and Single-Line Diagram development to Arc Flash training, you can trust our experts to keep your facility compliant and your employees safe. Got an automation problem you’re not sure how to solve? Wondering how your plant can work more efficiently? Our full complement of engineering resources are available to support you. Revere’s FEED+ process has become an essential aspect of planning and executing modernization of aging control systems. The FEED+ is a collaborative approach to discovery and scope development that will result in guaranteed capital cost for full scope electrical and control system projects. FEED+ will give you a complete picture of where you stand, and our migration planning and specification development services help you plan out where you want to be. We also have expertise in virtualization and mobility solutions, grounding and power studies, and radio path studies. Let us leverage our ingenuity for you. Are you listening to what your network is telling you? We offer a full range of technology services aimed at making your business perform more efficiently and securely. Our knowledge and experience let us tailor hardware and software solutions to fit your ever-changing technology needs, and our state-of-the-art ROVER 3 device allows you to monitor system performance and get remote engineering support with ease. Just like your industrial equipment, your network can become outdated, inefficient, and vulnerable without proper maintenance. Each year, billions of dollars are lost due to unplanned downtime and network inefficiency. Our experts can diagram your system, review hardware and configurations to find security vulnerabilities, determine points of inefficiency, and provide recommendations to optimize your network’s stability and productivity. Industrial operations produce more raw data now than at any time in history and having a powerful network capable of managing that data has become a necessity in today’s business world. We will help you harness that raw data and turn it into actionable insights by designing and installing layered networks to increase security and performance, as well as developing KPIs and dashboards that allow you to make decisions based on your own system’s data, not just guesses. The internet is vital to business, yet most companies don’t adequately manage the daily threat of being connected to the internet. Your intellectual property and physical equipment depend on the cyber security you choose to keep your business running. We start at the ground level with a cybersecurity risk assessment and audit service; this allows us to strategize for maximum protection. We’ll do whatever it takes to secure your network, including security plans, switches and firewall hardware, off-site backups, and sole source IT support through ROVER 3, serving as a virtual IT department. Let us help connect you to the future. When you encounter unplanned downtime, you need someone with the experience and creativity to quickly diagnose the problem and find a solution. We’ve been designing control systems since 1980; if there was an MD in Automation, we’d have it. Our field service support ranges from on-call remote support to maintenance contracts developed to fit a variety of needs and budgets. Benjamin Franklin once said, “An ounce of prevention is worth a pound of cure.” From annual calibrations and on-site inspections to outage planning and support, we can custom-design a maintenance plan for your particular needs to keep your system running in peak condition. By signing up for a maintenance contract, you’ll have the peace of mind of knowing that the experts are only a call away. No matter the cause, downtime of your plant’s control system costs you money. Automation and control technology is constantly changing, making it difficult and expensive to keep your staff current on every system component. Let us shoulder the load of keeping your systems online.